Delightful 2 bedroom, 1.5 bath end unit condo in Bellamy Forge. Beautiful dark laminate wood floors throughout main living area downstairs. Refrigerator, dishwasher, and sink disposal have been replaced in the kitchen. New and clean berber carpet on the stairs and in bedrooms. Spacious upstairs master bedroom with plentiful closet space. Upstairs bathroom is renovated with new vanity, granite counters, and tile floors. Front entrance has private courtyard with wooded deck and natural vegetation. Wooden privacy fence around front and back of home is maintained by the HOA and makes you feel completely secluded. Off the back of the home is a tiled, screened-in porch with brand new screens and small fenced in green space. Carport has All exterior maintenance is taken care of by HOA. Roof is scheduled to be replaced in Summer 2019. Neighborhood features: pool, amenity center, sport courts, playground, and green space. 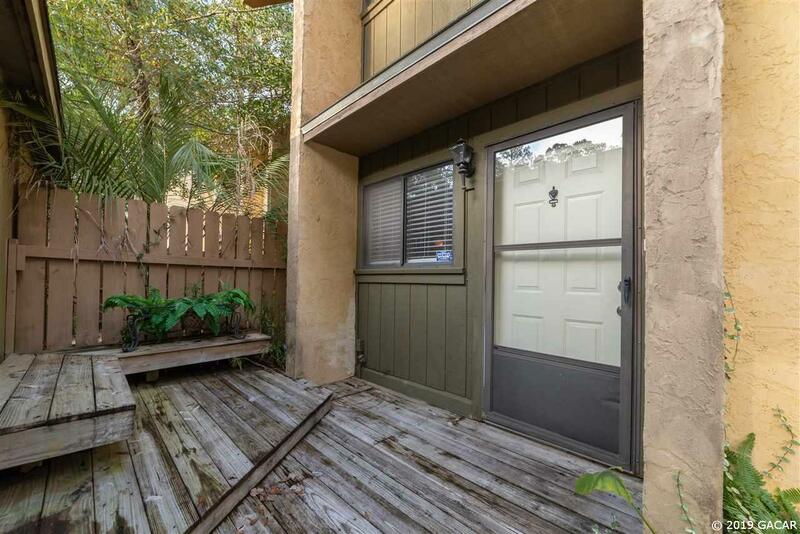 Amazing location, within walking/biking distance to Publix, Starbucks, and shopping. Extremely close to emergency room and only 10 minutes to UF. Tenant moves out March 15th. HUD FHA Approved Condo. Seller will purchase year long American Home Shield Home Warranty for buyer.